I am continuing to teach through chapter 8 “Of Christ the Mediator” in the Second London Baptist Confession (1689). Sunday before last I noted how the confession is grounded in three contexts (from latest to earliest): Baptist (believer’s baptism, independence/communion church government), Reformed (doctrines of grace, RP of worship, moral law of God, etc. ), and catholic (little “c”—universal) orthodoxy (little “o”—right believing) (listen to the sermon here). The latter of these is seen in the classical view of the triune God’s immutability and simplicity (“without body, parts, or passions”) (see chapter 2 “Of God and of the Holy Trinity”). It also evident in chapter 8 in the Nicene and Chalcedonian Christology. Christ is “the second person in the Holy Trinity, being very and eternal God” (8:2). And in the one person of Christ there are “two whole, perfect, and distinct natures [which] were inseparably joined together in one person without conversion, composition, or confusion; which person is very God and very man, yet one Christ, the only mediator between God and man” (8:2). Full of grace and truth (John 1:14). This section (8:3) of the 2LBCF is nearly identical to the WCF (with the exception of the addition of the phrase “in the person of the Son”), so the roots of this theologizing rests primarily with the Westminster divines. In the midst of this study, I have also been trying to do some reading (primary and secondary) from the Christological controversies of the fourth and fifth centuries. Among these, I have been reading Cyril of Alexandria’s On the Unity of Christ (SVSP, 1995) and was struck by his discussion of the special furnishing of Christ and how the concepts and proof texts parallel those used in WCF/2LBCF 8:3. Cyril (d. 444) was the patriarch of Alexandria who battled Nestorius in arguing that Christ was one person with two natures. Though Philip Jenkins describes Cyril as “an obnoxious bully” (Jesus Wars, p. 58), he was a dogged defender of the orthodox cause and his tenacity led to triumph over Nestorius’s views at the Council of Ephesus (431). He was sanctified along with us when he became like us. The divine David also testifies that the one who is truly Son was also anointed in accordance with his becoming flesh, which is to say perfect man, when he addresses these words to him: “Your throne O God is from age to age; a scepter of righteousness is the scepter of your kingdom. You have loved righteousness and hated wickedness, and so God, your God, has anointed you with the oil of gladness above all who participate in you” (Ps 45:6-7 LXX). Take note, then, that while David calls him God and attributes to him an eternal throne, he also says that he had been anointed by God, evidently the Father, with a special anointing above that of his participants, which means us. The Word who is God has become man, therefore, but has retained all the while the virtues of his proper nature. He is perfection itself, and as John says: “full of grace and truth” (Jn 1:14), and while he himself has everything that is fitting to the deity, we on our part “have all of us received from his fullness” as it is written (Jn 1:16) (p. 67). So, we see here the concepts of anointing, filling with grace and truth, and fullness, as well as the prooftexts Psalm 45:7 and John 1:14. 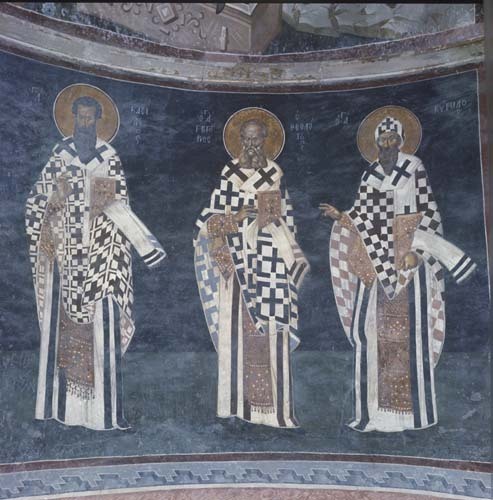 The WCF/2LBCF, thus, reflects the ancient reflections of Cyril and others in their recognition, definition, and defense of orthodox Christology.